Just in time for Star Wars week, Haier has announced the remote-control R2-D2 fridge is officially headed to the US. 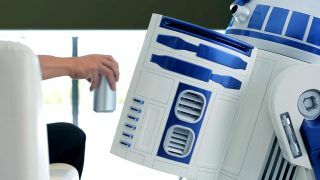 The life-size R2-D2 Moving Refrigerator, which functions as a fridge that you can move around in any direction using a remote control, was first unveiled earlier this year in Japan as the perfect brewski-carrying companion. Haier says the droid-size fridge hits all the intricate details of R2-D2, adding "the fridge is a faithful replica in terms of sound and movement." It also touts a fully functional built-in projector. While pre-orders opened up in Japan with a price tag of ¥998,000, Haier has revealed that it will cost US$9,000. Unfortunately, Haier hasn't set an official US release date yet, though the life-size R2-D2 Moving Refrigerator will be showcased at CES 2016, so we expect a launch date (or at least the opening up of pre-orders int he US) may be announced then. If you do choose to lay down $9,000 for the RS-D2 fridge, each one is custom made and comes with its own serial number plate and certificate of authenticity.